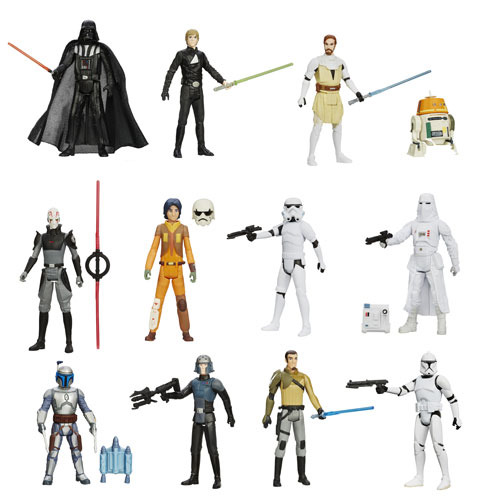 Awesome Star Wars Saga Legends Action Figures from the movies and Star Wars Rebels TV show! 3 3/4-inch plastic figures with roughly 5 points of articulation and a weapon. Just like the classic action figures of the 1970s and 1980s! Saga Legends are back! Generations collide as classic action figure engineering meets the modern era of Star Wars characters, giving kids and collectors a chance at sturdy, fun, and collectible action figures at a price that can't be beat. Awesome all-new likenesses have been sculpted for Jedi heroes and villains from the Empire, plus these 3 3/4-inch scale figures are ready to pilot your starfighters into battle. Each includes roughly 5 points of articulation and a weapon. Ages 4 and up.